On a recent visit to see our college-aged son in the North Carolina mountains, half the vehicles on the road were packed with Christmas trees headed home to the Piedmont. 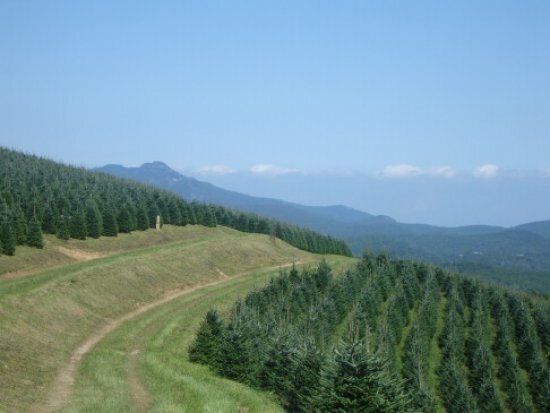 Lots of folks go to the cut- your- own- tree farms. I could just imagine those young families traipsing along rippling rows of Frasier Firs. Little children sitting atop their father’s shoulders. And afterwards, steaming cups of hot cocoa to blast the winter chill. I’m ashamed to admit this but I felt jealous at the thought of all that merriment. Like returning to my pre-pregnancy weight, cutting our own Christmas tree is one of those things in life I’ve completely given up on. It’s not simply that my husband and I no longer have little children at home to accompany us; it’s more that we would likely kill each other wandering among those acres of trees armed with an axe or a chain saw. Don’t get me wrong. My husband and I have a good marriage. We trust each other implicitly on most all matters except the selection of a Christmas tree. Perry has a pragmatic approach. He believes the Christmas tree and all associated décor should be acquired, erected and disposed of with as little effort as possible. He has been known to bring home sensible six and a half footers, trees so slight they slip through the door and into the room without our rearranging a single piece of furniture. Every few years he will procure (without my permission) some new-fangled type of artificial tree, from “very lifelike” to the openly defiant white wire tree to be decorated in what he calls a “whimsical” manner. My trees, on the other hand, are magnificent natural specimens which occupy a generous corner of the room, much like a baby grand piano or a full grown elephant. In addition to a little topping, mine often require a little bottoming as well. This year, an unsuspecting neighbor offered us to join him in his pick-up to get trees at a $25 lot up Highway 220. I thought it would be more festive if we all rode together. We could hardly wedge our three middle aged bodies across the narrow bench seat; the first attempt to shut the door hit my husband’s hip with a dull thud. He glared at me in a foreshadowing of events to come. I rotated myself almost sideways and the door finally closed, however it was a bit awkward when Mike changed the gears with the stick shift. “Well, it’s too late”, he remarked. Crossed arms and one eyebrow raised. He was perturbed. “What? I asked you to hold it.” This was incredulous. Honestly, all he had to do was stand there and look remotely interested in that particular tree. “Well, those people got it. It’s too late” he said. The next day I went to get my hair done by my hairdresser, Jim Smith at Changes Salon. I lamented all the drama of the previous day. Hair dressers are a woman’s first line of marriage counseling, of course! Jim does not make me feel better. He tells me about the numerous trees throughout his house, both live and artificial. He tells how he and his wife Starr carefully choose the tree and how Starr approves each decorating decision. He even has a beautiful tree decorated in gold, glass and crystal, much too breakable for my volatile household. He even pulled out his phone and showed me a picture. Impressive oohs and ahhs follow. “You don’t argue?” I ask. “Nope”, he says and keeps on snipping. I am in awe of Starr Smith. I’ll bet she has a light blue convertible too.